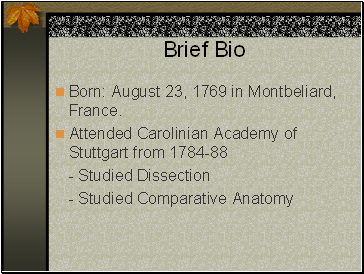 Born: August 23, 1769 in Montbeliard, France. After graduation, Cuvier served as a tutor for a Noble family in Normandy from 1788-95. While working as a tutor, he Composed 2 works on marine invertebrates. 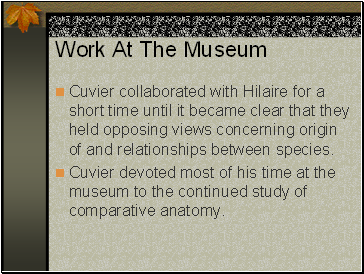 Cuvier collaborated with Hilaire for a short time until it became clear that they held opposing views concerning origin of and relationships between species. 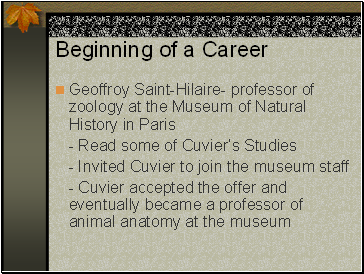 Cuvier devoted most of his time at the museum to the continued study of comparative anatomy. 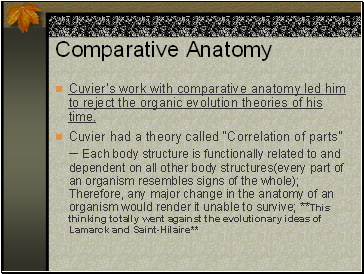 Cuvier’s work with comparative anatomy led him to reject the organic evolution theories of his time. 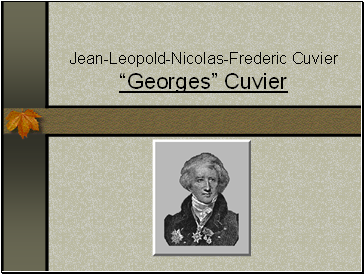 In addition to his scientific studies, Cuvier was appointed, by Napoleon, to be the Inspector-General of public education in France as well as State Councillor. 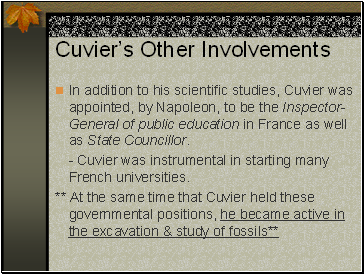 - Cuvier was instrumental in starting many French universities. This raised serious evidence that entire past species had become extinct in some way. This evidence for extinction may be the “most crucial and longest-lasting contribution to evolutionary biology” on Cuvier’s part.